Studio City in Los Angeles, California, has history dating almost 100 years, with the current population of over 37,000. Housing is at a premium here and it follows that the auxiliary services of house maintenance are needed here. With 20+ years’ experience, we at Rapid Plumbing are experts in all things related to plumbing. Having gained valuable insight and experience with traditional means of repairing drains, we now specialize in trenchless drain maintenance and repair. Trenchless pipe repairing is the absolute opposite to traditional way. There are numerous benefits to having your plumbing system repaired with trenchless system, also known as Cure In Place Plumbing. CIPP does not involve digging up of your premises. Whether the fault lies with internal plumbing or if the outdoor pipes are creating a problem, we’ll conduct a detailed survey and tell you exactly what’s wrong. From a main connecting point of the plumbing network, we’ll insert a CC camera into the maze of pipes and send it all over to show us exactly what the problem is and where. Once our qualified team has the required information, they’ll make a call on whether the solution is simple lining of the damaged pipe, or if a large-scale replacement needs to be carried out. In the former, a resin pipe is threaded through the channel to plug the cracks or holes that are causing a problem. In the latter, the resin coated pipe is blown and moulded to break the older pipes and create new ones. We send in tools loosen the accumulated scum and roots. This makes the process of pumping resin through the pipe easy. CIPP requires less labour and is not as time intensive as the traditional methods. Where drain replacement would take weeks to be done, this way of doing the same may take a few hours to get done. Option to scale operations according to requirements. Trenchless drain repairing is not a single solution that has to be used as is. It can be scaled to do as much or as little as required by you. CIPP is definitely cheaper than the older method, and you can now get your drains fixed for a fraction if the cost you would have earlier. 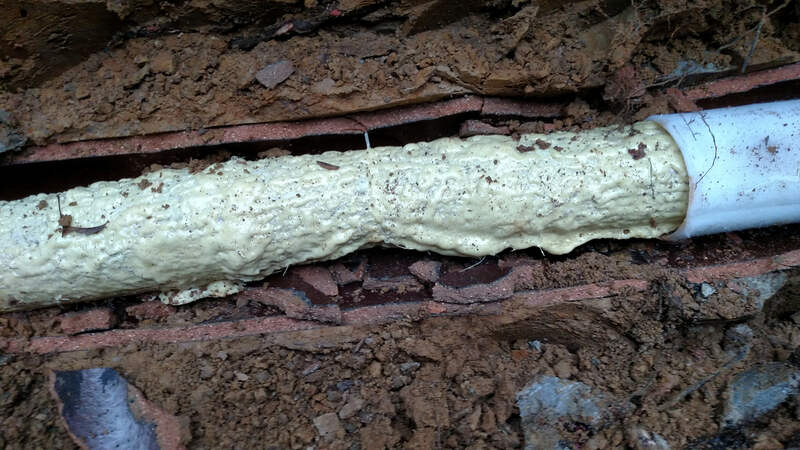 The resin used to line the pipes and make them as good as new again hardens into a substance as strong as concrete and can last any where between 10 and 50 years. For all these reasons, CIPP is the present and future of maintaining and repairing the drains at residential and commercial properties. Please give us a call at 1-800-99-RAPID and we’ll be pleased to inspect your premises for free. In case of something needing repair, we’ll be only to pleased to do it for you.